What is the Naadam? At the peak of their power the Mongol empire was the largest on earth. Their conquests ranged from the Danube in the west to Java in the east. Today the size and power of Mongolia is a fraction of that time. Modern Mongolia remains an immense territory but with a population of just two and a half million it is also one of the most sparsely populated countries on earth. The Nadaam is Mongolia’s annual sporting festival; a celebration of the manly virtues that made the Mongols once the most feared warriors on earth. The Nadaam operates for three days every year from 11-13 July. Where is the Naadam Festival? The most obvious place to view the games is in the capital city of Ulaanbaatar where the population swells well above its normal level of 800 000. Recently some purists have complained of the commercialisation of the games as it has become an increasingly popular spectacle for tourists. There is to some truthfulness to this and for those put off by this there is an opportunity to view the Naadam games at places such as Hovsgol, a small town far removed from the increasing crowds of tourists who attend the games in Ulaanbaatar. How can I see the Naadam Festival? 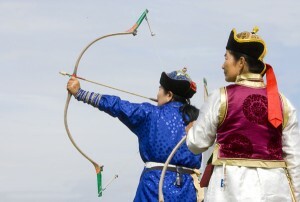 We can offer three options to view the Naadam Festival. All of our Trans-Mongolian trips between Beijing and Moscow and v.v. can incorporate Naadam. However the rail schedules usually require some re-jigging of the itinerary to fit. We have a set schedule for our most popular trip – the Big Trans-Siberian which features stops in Irkutsk as well as Ulaanbaatar during Naadam. Most of our trips can be customized to fit into Naadam so if you have another trip in mind then please contact us. For those who prefer to opt for luxury train travel, the Golden Eagle Trans-Siberian has itineraries between Ulaanbaatar and Moscow that incorporate the Nadaam Festival as well as their usual Russian stops. If you do not have the time or inclination to visit Mongolia as a rail stopover then we have several Mongolia itineraries that take in Nadaam as part of an in-depth exploration of this intriguing country. As always we can customise to suit but here is an outline of one of our group departures during Naadam. The most important of the three, the national sport of Mongolia. The wrestling is on a strict knock out round system – there are nine rounds in total. Surviving to the sixth round brings the title Nalchin (Falcon) and to the eighth, Zann (Elephant). Those who lose at the eighth aquire a further title, Arslan (lion) but only one man (and this is strictly a male sport) can become Avraga (giant). Before each round the performers must dance the Devekah – a dance in the style of the animal whose name they carry, if they are titled. The outfit is unique – Mongolian national style boots with turned up toes, a short jacket with open chest, and short trunks. There are no specific rules and any form of attack is permitted. A variety of short dashes, strikes, holds, hip-throws, shoulder-throws and smashes are the traditional repertoire of the wrestlers. There is no weight limit and indeed no weight categories either. There is no time limit – you fight on until one loses. Losing happens if your elbow, knee or back touch the ground. Wrestlers are hugely popular national stars with fan clubs and TV appearances, and the most successful wrestlers often pursue careers in Japan as sumo. Horse racing is a Mongolian national obsession. The most popular race is the last – in which all the riders are children. But this is no kid’s event; they are young boys, up to the age of seven, who can ride light in the saddle. The winner is feted like royalty but there is a touching ceremony for the boy coming last. A special song, Bayan Khodood (fat belly) is sung, which tells how the young rider tried his best but the stupid trainer over fed the horse the night before, and there were craters in his way, and stones too, but next year his horse will go like the wind itself, and his fame will glitter like gold…. This sport has fallen out of favour in recent years with the development of more sophisticated weaponry. Nowadays the day devoted to archery is relaxed and something of a prelude to the horse racing. It still has its fans however. Men loose at 75m from their target (leather rings fixed to a wall) and women loose from 60m. A man has 40 arrows and must score with at least 18 of them. Women must score 13 from their lower allocation of 20. An unusual feature of the archery is the singing that accompanies it. Traditionally the man’s friends form a choral group to the side of the target and sing an Ukhai (stropic folk-song) to cheer him on.